Docking Tails has become a hot debate for many breeds. Looking into the history of docking is critical to understanding the toy fox terrier and why it is a docked breed. Working terriers are docked for the same reason as many gun dogs breeds that have to hunt game through heavy vegetation and thick brambles. The terriers fast tail action can easily lead to torn and bleeding tails which are painful and extremely difficult to treat. Docking the end of the tail eliminates the risk of injury and subsequent infections resulting from such injuries. This pup’s tail is curving but it is still more correct than most natural toy fox terrier tails seen in conformation. Why? This has always been a docked breed. Docking Bans: According to the Council, since docking was banned in Sweden in 1989, there has been a massive increase in tail injuries amongst previously docked breeds. Within the 50 undocked Pointer litters registered in that year with the Swedish Kennel Club, 38% of dogs suffered tail injury before they were 18 months old and in 1991, the number of individuals with tail injures had increased to 51% of the group. Sadly, there is no such study of the few Toy Fox Terriers present in Sweden or other countries outside of its country of origin, the United States of America, as to what types of and how many injuries the breed has suffered due to growing a trend to leave their tails natural. There are over fifty traditionally docked breeds which are recognized by various registries and the Toy Fox Terrier is one of those breeds docked not for appearance alone but for a working purpose. Unfortunately docking has, in recent years, come under the scrutiny of the animal rights activists who term it an "unjustified mutilation". These activists are frequently against breeding and exhibiting dogs, as well. However, breeders, dog owners and an ever growing number of veterinary surgeons disagree with this trendy view, believing that if docking ceased, many breeds would suffer! They maintain that docking is a perfectly humane procedure when properly carried out, and one which prevents far more distress than it causes. Like spaying and neutering, it is simply a practical animal management technique which should remain available to dog breeders and owners. Judging Viewpoint: What do we do with the undocked Toy Fox Terrier or any other breed exhibiting in the conformation ring when the history and standard clearly indicate that it is a docked breed with specific guidelines as to the length of the tail? After all, there are exhibitors importing dogs from Sweden, Russia, and other countries. Some countries are under the tail docking ban, so what should be the response be of judges viewing the Toy Fox Terrier exhibiting with a natural tail? The answer is simple. Judges are required to understand the history of the breed and its standard and judge the dogs in the ring accordingly. Judges are more than capable of determining how to respond to natural tails for the Toy Fox Terrier or any docked breed, just as they are able to determine appropriate responses to natural bob tails or uncropped ears. American judges are at the forefront of any trends for the breed. Rewarding exhibitors with undocked tails in breeds with standards that describe docked tails (or cropped ears) does promote the concept of natural tails just as narrowly judging them for one specific trait or another. Consequently, it rewards the agenda and promoters of anti-docking legislation. This type of judging leads to the extreme changes often seen in other breeds over time. Sadly, those changes are rarely in the best interest of the breed. Fads come and go but the breed history and standard should remain constant. Judges should follow the written breed description unless the Parent Club or Registry sees fit to change it. Judges no not have permission to circumvent or ignore the Breed Standard because of personal opinion or current political positions. Docked Dilemma: Ok, so you’re judging and the event or kennel club insists that dogs exhibiting with natural tails cannot be excluded, excused, or penalized. How, then, do we judge the long tail on the toy fox terrier or any breed in which the standard specifies docked or tail length? Simple. Tail too long, not in proportion to the size of the dog, not carried erect, not docked to the 3rd or 4th joint (AKC Toy Fox Terrier standard) or as is described in any docked-breed standard. Tail fault is noted. That tail should not be rewarded but what if the dog is outstanding in every other way? Put the dog up, but be certain it’s because it’s the best dog in the ring, and not because you agree with a political agenda. What should the correct natural tail look like on a toy fox terrier? Simple. It should be a direct extension of the correct docked tail standard. The tail should be straight up with no curve. 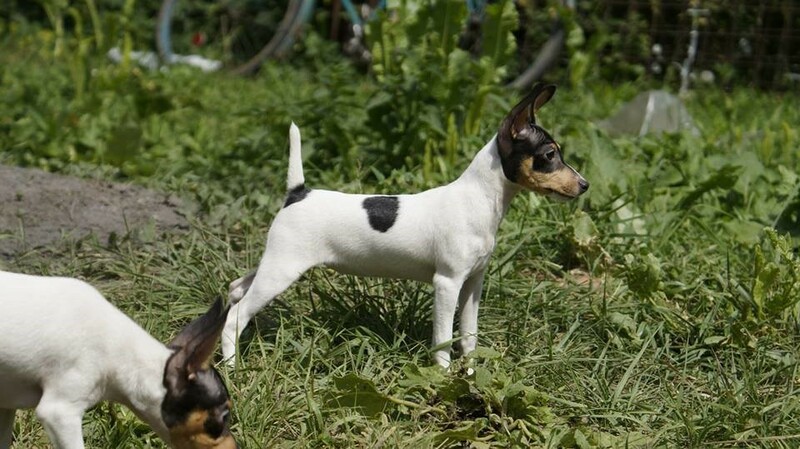 Can a toy fox terrier have a natural tail like that described in the UKC or AKC standards? Absolutely!